Make the back up a smooth and effortless manoeuvre with Lou Roper’s guidance. As told to Annie Haresign. Photography by Obi Igbo Photography. The back through is a common obstacle found at all levels in the trail class. This is usually presented as a slot between two poles and may include a change in direction in more advanced classes. Being able to back your horse up is a key skill to have for general riding and often necessary when out on a real trail ride. 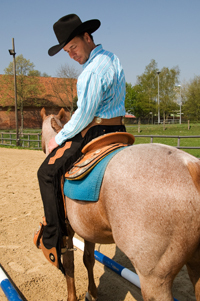 There are several techniques for teaching a horse to back. It’s best to keep it simple and easy for both horse and rider. Here I will explain the cues for one method. First, very slightly lean back (or ‘sit down’) in the saddle – not too much, just a slight amount so that the horse can feel you. It’s a similar position to when you are riding forward and you would like to slow your horse down. Next, gently draw back on the reins just enough so the horse starts to rock back and takes it’s first, small step; at that time slightly push your hand forward to release the pressure and indicate to the horse to stop backing. Do not make the common mistake of saying ‘Whoa’ while pulling back on the reins as that is likely to make a well trained horse back faster. Have your legs close to the side of the horse so that as you need to move his hindquarters one way or the other, the leg is not a surprise to him. By keeping your weight in your heels when you want to back up, your horse will eventually learn to step back when he feels the shifted weight in the saddle and stirrups. This will allow you to minimise the movements of your hand and produce an overall, effortless back up that will impress the judge. Before you attempt to back through poles, remember to perfect your back up free from obstacles in the arena. Try to back your horse up with only the slightest pressure and physical cues. You want to show the judge that your horse is easy to move in any direction. Once you’re happy with your horse’s progress, it’s time to introduce the poles. When we first do the slot I like to place the poles wide apart so the horse doesn’t feel claustrophobic and is less likely to be discouraged by hitting them. As you can see by watching the accompanying video, Martin starts the backup by lifting up his hand, drawing it back thus moving the horse in a very slow manner, not fast, not quick. The horse must take nice even, slow steps, look quiet and respond to the slightest request from the rider. The steps shouldn’t be too big but must be soft and rhythmic. You can look down at the poles. You’d always look where you were going if you were driving a car wouldn’t you? By looking down and to the side, you’ll see where your horse is putting his feet and also see how straight you’re going. However, make sure that should you slightly shift your body while looking down, that you don’t unintentionally signal the horse to move. In the trail pen, the judge wants to see you perform a clean, straight back up without touching or striking the poles. For those who’ve never attempted this obstacle – it’s more difficult than it looks! In the video, you’ll see how Martin places Relic a little too close to the right pole and shows us how to move the horse over quietly. When your horse steps back too close to the right pole, gently apply your right leg and guide the horse over towards the left as he’s backing. Remember to be nice with the leg and soft with the hand. It’s the same should your horse be too close to the left pole; apply the left leg and ever so gently guide him back to a central position. This correction to the position of the horse in the obstacle becomes far easier when you’ve practised your back up and you can move your horse with ease and with minimum leg and hand movement. When you’re going straight in your back up, increase the difficulty and test your accuracy by placing the poles closer together. As with the other obstacles in the trail class, doing a back through slot or practising your back through takes a lot of repetition. Horses need to coordinate their feet during the back up and most of the work we do is in forward motion so you have to take the time to practise. The more you practise this manoeuvre; you’ll find your horse learns to take soft back steps and when you apply your leg to go from one side to the other, they’ll do so quietly without taking big steps. When you’re confident with this basic obstacle, why not try progressing to an ‘L’ shaped obstacle made with four poles. Remember to keep them positioned wide apart to start with and then decrease the distance when you and your horse are more confident. Being able to perform an accurate, well paced back up will not only help you win in the show pen but be a very useful skill to have in your every day riding. In perfecting the back up it will take time to coordinate your hand and leg so that you can keep the front end of the horse in one sport while moving the rear – and vice versa!